All new Genuine Barnett hydraulic brake and clutch lines are now available! Designed to match Barnett cables, they are available in Classic Stainless braid, Platinum Series bright silver, black with chrome fittings and Stealth ‘black on black’. These new Barnett brake and clutch lines are available in stock and full custom lengths to fit Harley Davidson, Victory and Indian models through 2018 with ABS lines being available as well. As with genuine Barnett cables, a 24 hour rush service is also available on the brake and clutch line kits. 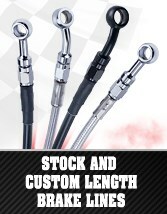 Like all Barnett products, these brake and clutch lines are proudly made in the USA. To view/order Barnett brake and clutch lines, click on the "brake lines" tab on the home page then hover over "brake/clutch lines for HD" and then select from Big Twin, Sportster or Clutch lines. Please note the brake and clutch lines listed on our website are for stainless braided lines (with clear coat). If you would like to order lines in Platinum Series bright silver, Stealth black on black, or black with chrome fitttings or if you do not find your model listed, please contact us at 805-642-9435 or at sales@barnettclutches.com for pricing and ordering information.